The mystery of the Drouyn snare drum. 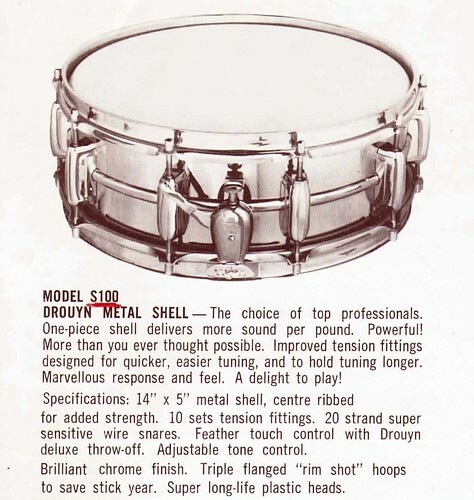 “Mystery” may be an exaggeration; but it’s true that there is little correct information available on the Drouyn S100 alloy snare drum. A search will reveal a few pages on this drum and almost all of them will include a claim that the shell was made by Ludwig. To understand why it has been widely believed, we first need to look at the snare drum, as an instrument. Modern snare drums are descended from a military drum called a tabor. These were used by men on foot, so weight was a factor. Early drums were probably solid wood. A solid wood drum is heavy; so marching snare drums were soon developed using a thin sheet of wood, rolled into a tube. This technique evolved into using pieces of wood in layers or “plies”. This method of drum making is still the most commonly used today. Metal snare drums are usually louder and brighter than those made from wood. Early metal drums were made from materials such as bronze, brass and copper. They were either cast or rolled from a sheet of thin metal. 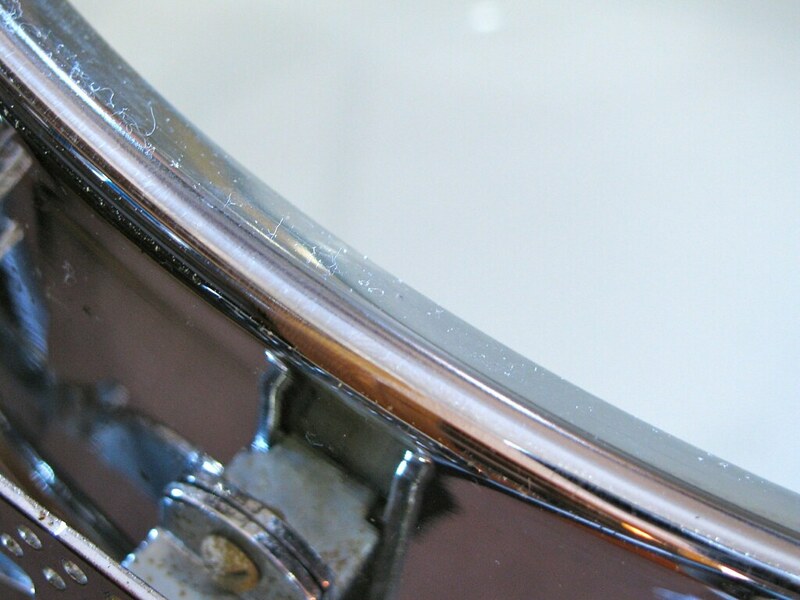 Bearing edges (the edge of the drum onto which the drum head is stretched) were created by bending the metal; then the seam was welded, smoothed and the shell finally polished or chromed. Brass and steel became popular for this. 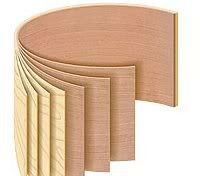 The majority of Dandy drums were made from wood ply. 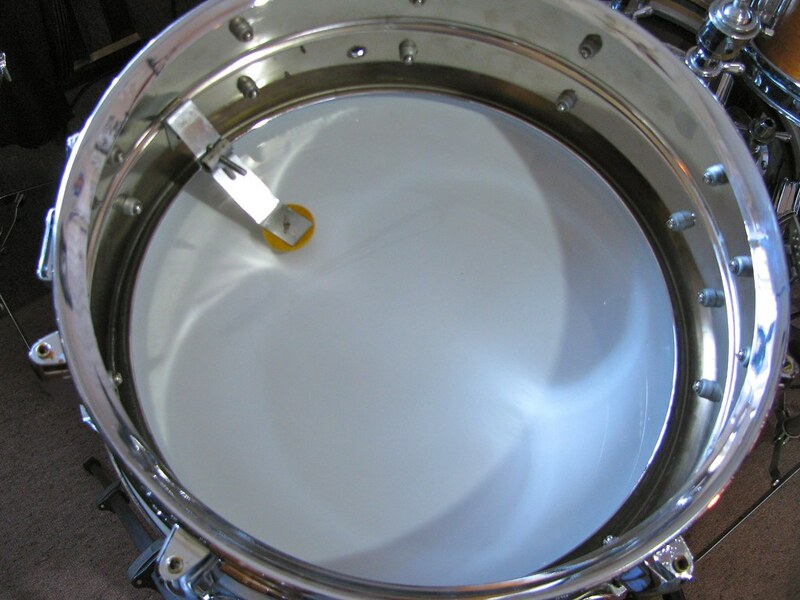 In the early part of the 1960’s, aluminium came to the notice of drum makers looking for alternatives to brass. Alloy snare drums were light, cheap; and sounded good. Alloy does not weld easily. However, it can be pressed into almost any shape. 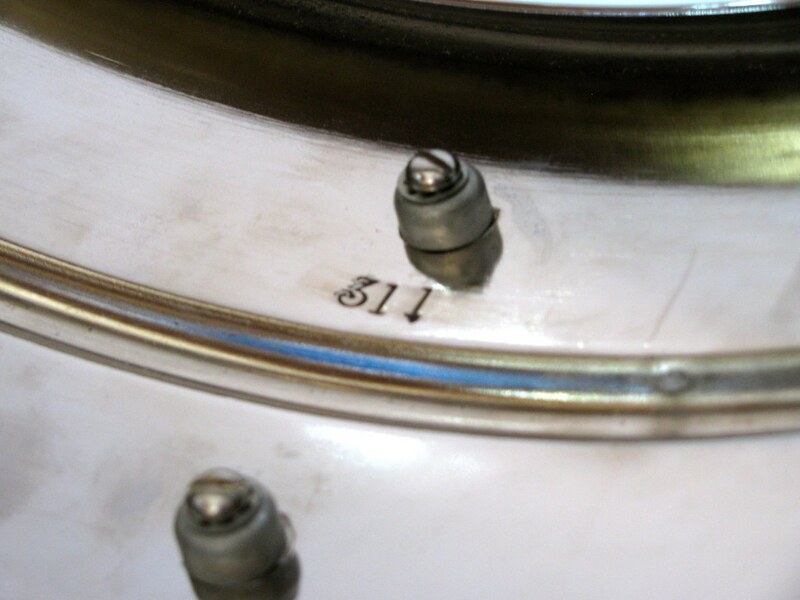 One USA drum maker took this technique further and succeeded in designing what is possibly the most successful metal snare drum of all time, the Ludwig “Supraphonic 400”. The Supraphonic is made by spinning seamless round tubes of alloy. It’s likely that Ludwig outsourced this job to a metal plant, which had the capacity to do this on a large scale. One problem with alloy is the application of chrome, which does not easily stick to aluminium. 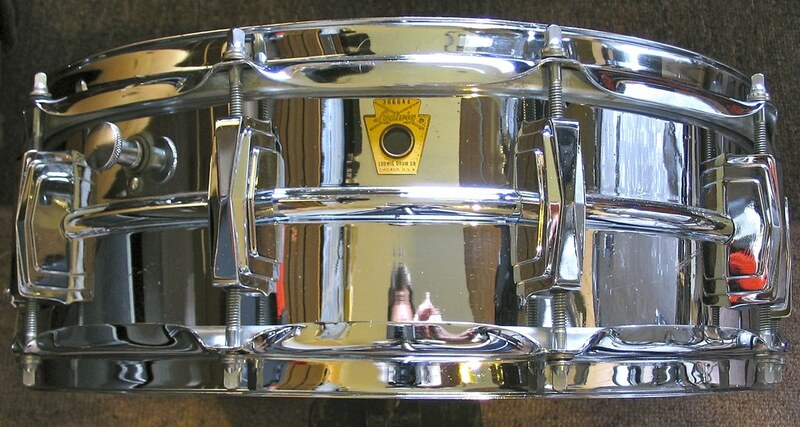 There are many examples of alloy snare drums which have lost their chrome plating. For Ludwig, this work would most likely also have been done elsewhere. Back at the factory, blank shells were drilled for lugs and then assembled and finished. 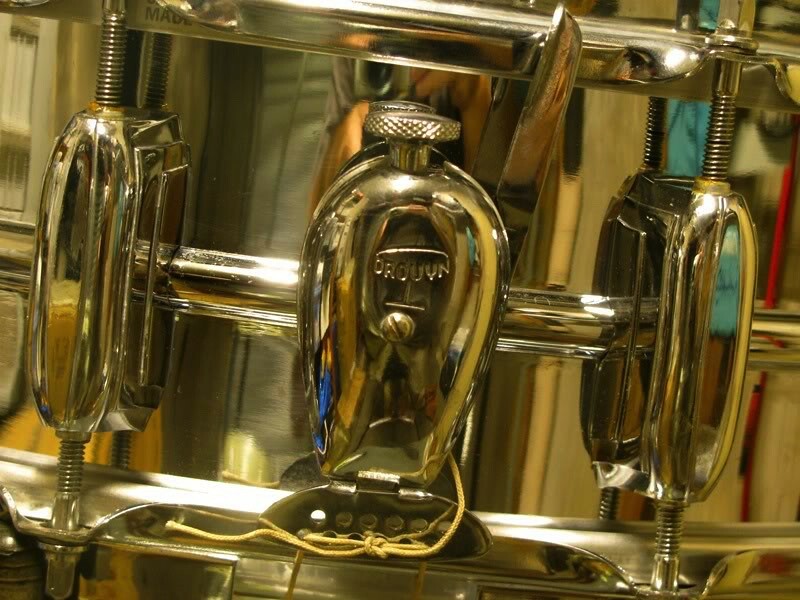 Only Sonor in Germany were widely known to have made their own metal snare drums, completely in-house. However, the Supraphonic quickly gained icon status; and for good reason. Enter the S100 – the Drouyn version of the Ludwig Supraphonic. To attempt this in Brisbane in the early 1960’s, demonstrates a spirit of “can do” engineering. In fact, this type of project hasn’t been done since in Australia, on any scale. Assuming that Drouyn did outsource the shells to a metal works; there would still have been a lot of work on prototypes and a lot of trial and error. So were the shells from Ludwig – or Ludwig’s supplier? A look at the two drums shows substantial differences. The lugs are obviously different. Moulds for the throw have been discovered amongst the contents of the factory. The shell is a very simple design. And close enough to the Ludwig version, that ever since it has been described as a drum with the “shell made by Ludwig, the rest by Drouyn”. However, there are many differences in the design of the two drums. 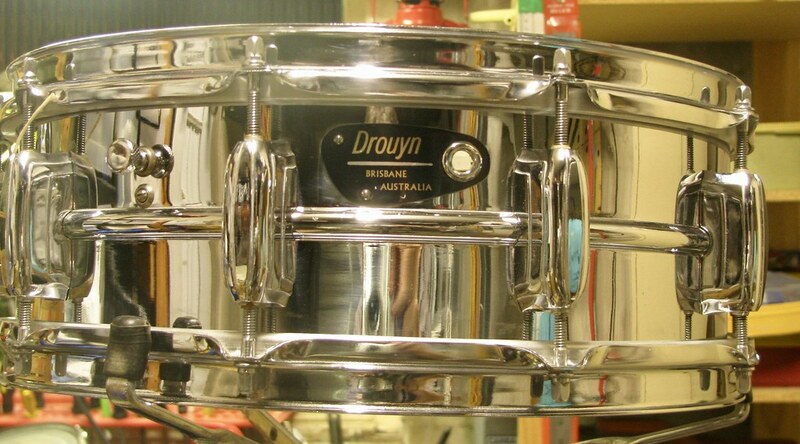 Drouyn S100 snare drum. 10 lugs, centre bead, round dampener; not visible: “Drouyn” side throw. Ludwig Supraphonic LM400 snare drum, 1968. 10 lugs; centre bead; round knob dampener. Not visible – P83 strainer. A close examination of the two drums reveals some critical differences. 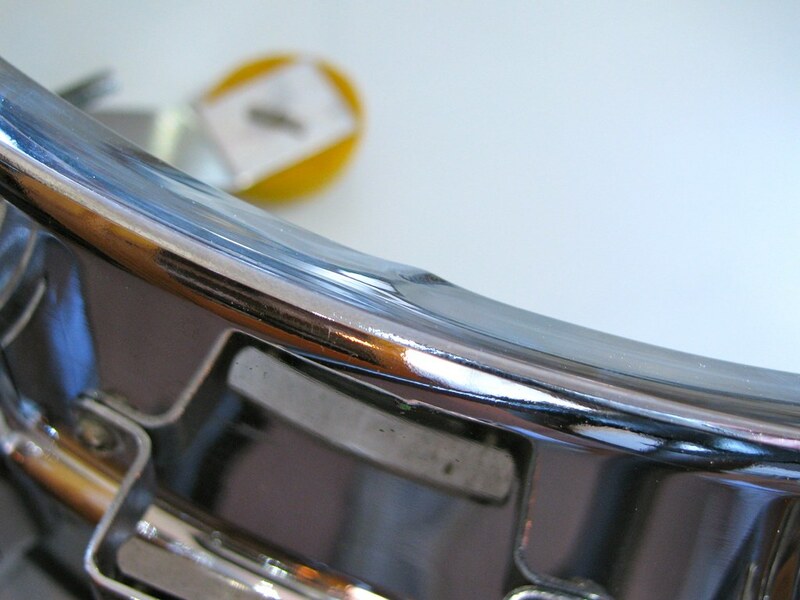 The most important parts of any snare drum are the edges; and the beds – the area in which the snare wires sit. The bottom bearing edge of the Drouyn snare; with stepped profile. The Drouyn shell has an edge with a width of 9mm. 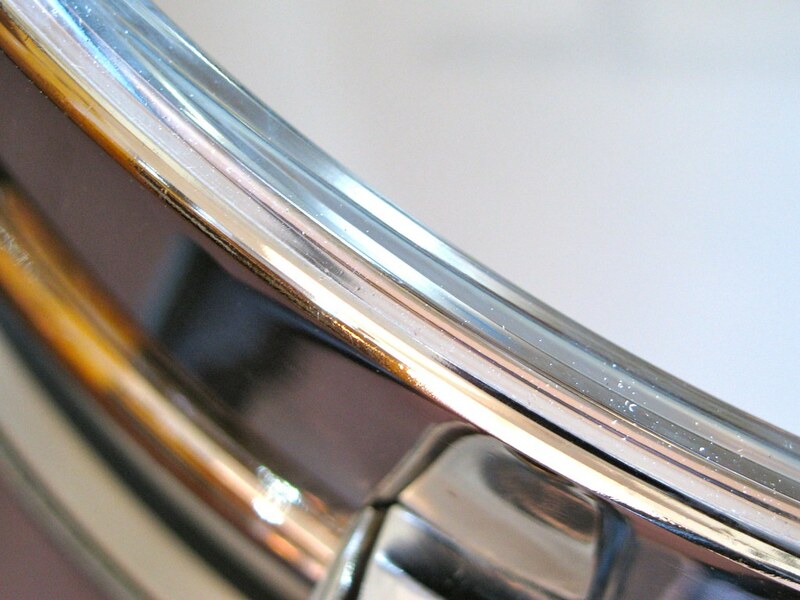 The bottom bearing edge of the Ludwig snare. It has a flat profile. The Ludwig bearing edge has a width of 12.5mm. The snare bed of the Drouyn snare. Note the wide shallow profile. The snare bed of the Ludwig snare. Note the slightly deeper profile. Drouyn snare bed. The problem of creating a small snare bed has been overcome very simply in the Drouyn drum, assisted by a handmade crimp. Ludwig snare bed – no crimping. It’s not difficult to draw a conclusion, from even a brief examination of the two drums. The shells are different; the lugs are different; and up close, even the finish is different. But if imitation is the sincerest form of flattery, then Ludwig should have been flattered. The Supraphonic is a landmark snare drum. To attempt to copy it is aiming high. 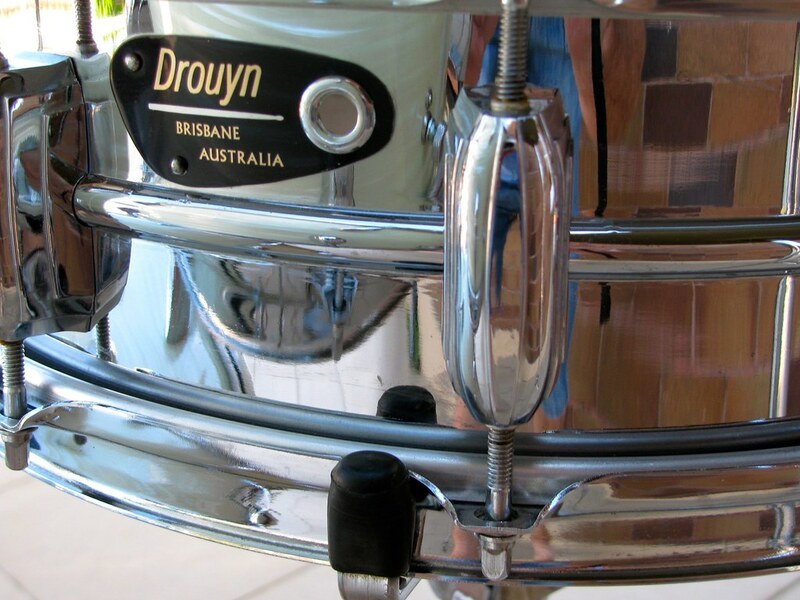 The Drouyn S100 sounds similar, simply because it’s an alloy snare drum of the same size. But more than that; it’s an excellent drum with it’s own unique sound and character. When you play them side by side, the tone of the Drouyn is actually quite different. Listen to a comparison here. In researching this subject, I spoke with people with excellent knowledge of the company, who told me that these snare drums were made in Brisbane and electroplated by Minnis & Samson (who chromed all of Drouyn’s parts). After seeing the evidence up close, what I can say is that I find it extremely unlikely that Ludwig had any real input, apart from the inspiration. Who made the shells is still not public knowledge. Drouyn historian Tony Moore says that the shells were made in a location close to the Drouyn factory and that “the mould is still there” Minnis and Sampson (Drouyn’s chrome plating source) are skilled enough to have done this work. Recently, major discoveries in the Drouyn factory archives, have provided more clues. To me it seems certain that the S100 was made in Brisbane. Regardless of their heritage, when I look at the Drouyn S100, what I feel is admiration. My experience with Drouyn has taught me that for a company with Douglas Drouyn’s vision and George Meacham’s engineering skills – practically nothing was impossible.